Welcome to Shipwatch. You came here for the beach and with the great above the trees 3rd floor location of this unit, you have the best views of one of the best beachs in South Carolina. Shipwatch has the best beach available on the Isle of Palms and when you are ready to go to the beach you are only an elevator ride and a few steps away from the walkway to take you there. Do not forget to get the beach chairs out of the lock-up so you can relax when you get there. You are well located to enjoy one of the best views of the oceanfront in Wild Dunes. You can enjoy breakfast, lunch, dinner, and happy hour on the covered and furnished deck facing the beach. Great beach and ocean views are available from the Living Room, Dining Area, Master Bedroom, Kitchen, and Deck/Covered balcony. All seasons are great times to enjoy the beach,the walking paths and Charleston. Temperatures are moderate to warm with the average highs by months Mar -Aug respectively of 65, 72, 80, 85, 89, and 87. With the nice weather swimming, walking the beach, shelling, golf, sightseeing and carriage rides in downtown Charleston are some of the favorite activities. Do not forget Wonderfall (Oct. & Nov) great weather for sight seeing and downtown shopping, and cooler weather golf. Bring your family or come with some friends and create some great memories at our place on the beach. The Condo was recently remodeled and has new Kitchen and Bath Cabinets as well as two completely redone baths. The new granite counter tops, stainless steel appliances, tiled kitchen and dining area look great. The Master Bedroom features a very comfortable King sized bed, Black out drapes, dual side tables with reading lamps and a large 9 drawer dresser with a hutch top that encloses a flat screen TV.. The recently redone Master Bath has a large glass enclosed shower and huge double vanity that is mirrored and well lit. The living area and the bedrooms just had new bellawood select oak hardwood floors installed. It just does not get much better than this. The Shipwatch Condo has the nicest grounds in Wild Dunes and the nicest pools on the resort as well as a Beach Gazebo for the adults, and a children's playground central to everything. 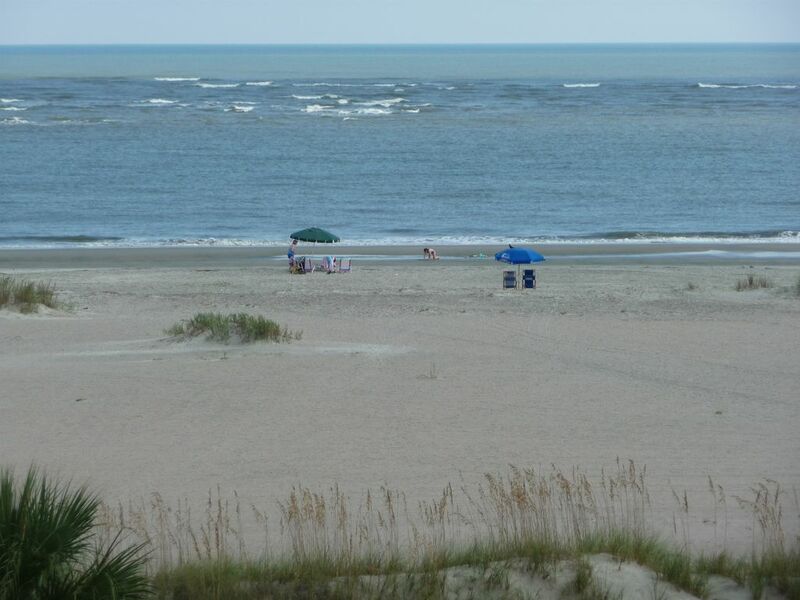 Wild Dunes is a private gated resort community so the beach is not overly crowded. When you are ready to eat, there are several nice restaurants on the resort but you are very close to both Mount Pleasant and Charleston, so great dining, shopping and sightseeing opportunities abound close by. * a new large 37' LED HDTV and DVD. Great for the free Current and Classic DVD's we now offer. * a new free high speed wireless internet service. The Wild Dunes Resort features two beautiful Golf Courses, nice walking or bike riding paths, the spa, shops and restaurants. So come for the Beach, Sightseeing, Shopping, Dining, Golf, or the Spa. Most importantly Come Relax and Enjoy. The beach is just an elevator ride and boardwalk away. Downtown Charleston is just a twenty minute drive away. Come and enjoy! Pictured are 3 of our 4 Grand children who love the SC Beaches. Eli our forth grandchild is just a baby so it will be next year before he learns to enjoy the beach like the rest of us. Jeanette and her sister Billie were born in SC. I was born in NY and moved to SC in my teens. When Jeanette and I got married we moved to several different cities some she liked, like Williamsburg Va. and some she just made the most of like Detroit. Jeanettes' sister Billie moved to Mt. Pleasant SC after getting married and thus the start of our connection with Charleston and Wild Dunes. Our families vacationed and visited many times together over the years and we learned to love the low-country thru this process. Jeanette and I love the beaches and warm ocean waters off the Charleston coast. We love to walk the beach, go sightseening in Charleston and enjoy the good restaurants in the area. The beauty of Charleston, the low country and Wild Dunes as well as all the golf and Tennis opportunities were like magnets to us and our family. We started looking at properties in Wild Dunes in 1996 but really did not get the opportunity to buy until 2003. We love our Villa and have spent the last 14 years re-doing the entire unit. It's how we want it now, nothing left to do but enjoy and enjoy we will. For Sure an elevator Ride away. Also provided great views, DVD's and departure cleaning. Washer and 220 volt dryer stacked in storage and pantry unit in the villa beside the kitchen. New 220 volt dryer stacked on washer in Pantry/storage area. Under building, and in front of building 2 spaces not assigned. Overflow parking available please ask. 8 sets of hand and bath towels, bath mats, face cloths. New (2019)50" 4K HDR Smart flat Screen TV in main Living area. Smaller flat Screens in both Bedrooms. (2) The one in the living area is a brand new HD TV and we also have HD sevice and additional channels on this TV. Great condo and location! Everything was perfect and owners were extremely helpful and accomodating. Glad you enjoyed the condo Chris. Please keep us in mind and call when you would like to come back. We were pleased to accommodate your party. Wonderful week spent on the Isle of Palms! 303 Shipwatch was attractive and cozy offering a beautiful view of the ocean. The owners offer beach chairs and paddle boards to enhance the ocean experience. The pool was great too. This was a very relaxing trip! Hello Ann, Glad you and your friend enjoyed our place at the beach. That is one of the nice things about the Isle of Palms and it's location so close to Charleston. You can have a relaxing or an exciting and busy vacation, it is just as you wish. Make it what you want it to be. Have some history, some good shopping, some great restaurant experiences and some relaxing toes in the water time. Do come back we were glad to have you and look forward to your return. This is an excellent place to vacation. The property is clean, spacious and has a home like feel. Attention is given to detail, customer service and convenience. The Isle of Palms/Wild Dunes is also conveniently located to many major points of interest and great restaurants around the Charleston area. With most historical locations within a thirty minute, to less than an hour drive. Over the last six years my family and I have vacationed in this area on three occasions. This property is by far the best place we have stayed. Thank you for the nice comments about our condo and the area. So glad you and your family had a great stay, and visit to Wild Dunes and Charleston. We appreciate you choosing our condo and look forward to having you back. Nice condo with beautiful views! This was our first visit to IOP and we really enjoyed our stay! The condo was at the perfect location and had the most amazing views. The kitchen was well stocked and we loved having the outside storage for beach supplies. It was so nice having beach chairs and sand toys provided. We will be back! So glad you enjoyed your visit to Charleston, Wild Dunes and our place. We are getting ready to go back down to our place in a few weeks and we also, after all these years are excited and looking forward to our trip. We are going to try out one new and several of our old favorite restaurants and then of course we will visit downtown for awhile. Whitney we will keep the place up , clean and ready for your next visit. Please do come back. Very attractive and comfortable condo with great ocean views! My sister, niece and I spent a week in this attractive condo. We loved the ocean views! The owner was friendly and helpful, and we would definitely recommend staying here. We hope to be back soon! Glad you enjoyed your stay and we would love to have you and your family visit our place again. Beautiful beach and views. Wild Dunes is a lovely community. Clean and well appointed condo. It was just my husband and me so we didn’t use the second bedroom but the beds there seemed suitable for children only. Hope to come back soon! Glad you enjoyed our condo and the terrific ocean view. We will keep the condo in good shape and well equipped, so please plan on coming back to enjoy it again in the future. Some time frames may have discounts so please feel free to inquire. Rates may change until your reservation is made.